Dr. Tabaddor has been practicing orthopedic surgery since 2009. He is a fellowship trained, CAQ certified sports medicine orthopedist, with a special concentration in hip and pelvic-related disorders (including femoroacetabular impingement, gluteus medius tears, athletic pubalgia and iliopsoas tendon tears). Dr. Tabaddor treats a wide range of sports related injuries, both surgical and nonsurgical, and he has had specialized training in hip arthroscopy. He holds an undergraduate degree with honors from Boston University and an MD from Boston University School of Medicine. Additionally, he completed his surgical internship at Brigham & Women’s Hospital and his orthopedic residency at Harvard Combined Orthopedic Residency Program, where he also served as Chief Administrative Resident. Dr. Tabaddor’s professional affiliations include: American Orthopedic Society of Sports Medicine; International Society of Hip Arthroscopy; American Academy of Orthopedic Surgeons; Arthroscopy Association of North America; and RI Orthopedic Society. He is a member of the physician referral network for USA Gymnastics and the Team Physician for the US In-line Speed Skating Team. Dr. Tabaddor sits on the Sports Medicine Advisory Committee of the Federation of International Rollersports and the Sports Medicine Advisory Committee of the Rhode Island Interscholastic League. He has also provided coverage for Special Olympics, Boston Ballet, URI athletics and various high school sporting events in the state of Rhode Island. He is an avid runner and swimmer and enjoys participating in triathlons and paddle boarding. Dr. Tabaddor resides in Providence, RI. Understanding Athletic Pubalgia: A Review. Cohen B, Kleinhenz D, Schiller J, Tabaddor R. R I Med J (2013). 2016 Oct 4;99(10):31-35. Review. Fixation of juvenile osteochondritis dissecans lesions of the knee using poly 96L/4D-lactide copolymer bioabsorbable implants. Tabaddor R, Banffy M, Andersen J, McFeely E, Ogunwole O, Micheli L, Kocher M. J Pediatr Orthop. 2010 Jan-Feb;30(1):14-20. doi: 10.1097/BPO.0b013e3181c6318c. Transsphenoidal meningoencephalocele in adults. Jabre A, Tabaddor R, Samaraweera R. Surg Neurol. 2000 Aug;54(2):183-7; discussion 187-8. 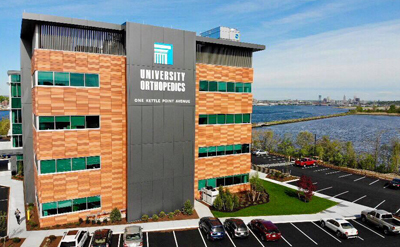 With fall sports getting into full swing, University Orthopedics, Inc. sports medicine surgeon Dr. Ramin Tabaddor was featured in Providence Business News Five Questions this week. Dr. Tabaddor addresses several topics including what sports tend to see the most orthopedic injuries, concussion issues and prevention and why teaching future orthopedic surgeons is important to him.